It’s the first week of December and things are hotting up, big time - and not just the mulled wine. As the deadline fast approaches for the less organised among us (guilty as charged) to get those last minute Christmas pressie orders in before it’s too late, online retailers are pulling out the big guns in the email stakes to get people buying. When consumers have a barrage of Christmassy emails flooding their inboxes every day, standing out from the crowd is incredibly important for online retailers. Here are our top ten favourites from the festive season so far (click on the title to open the whole email). Why we love it: This GIF-tastic email from online knitwear retailer Wool and the Gang is probably our fave of the bunch, making it easy for beanie buyers to find exactly the right gift by segmenting the knits by theme. We also like how it promotes the brand story at the bottom of the email. Why we love it: Canadian men’s clothing retailer Frank & Oak - a brand ‘for men who want to look sharp every day of the week’ - offers this great guide to what to wear this season in which pretty much every eventuality is covered, from the office party to evening engagements to slouching around on the sofa at home. No garish Christmas jumpers to be found here, kids. Why we love it: Whether you’re in a generous festive mood or feeling like a big old scrooge, Accessorize uses this email to demonstrate how it has got your girly gifts covered, np. We love how individual items are hyperlinked to their respective product pages, so no scouring the website to find them. Subject line: We’ve Got Major Cabin Fever! Why we love it: Feeling a bit feisty this festive season? This brilliant image-led email from Dolls Kill (complete with animated Christmas lights) showcases the alternative online boutique’s ranges - from the ‘ugly sweater party’ collection to holiday onesies. Why we love it: If it weren’t for the powerful ‘shop now’ calls to action, you’d certainly be forgiven for thinking that this email was taken straight from the editorial pages of a glossy fashion mag - showing recipients how to recreate the styles of Liv Tyler, Alexa Chung and Laura Bailey (all with Dotty P products, of course). 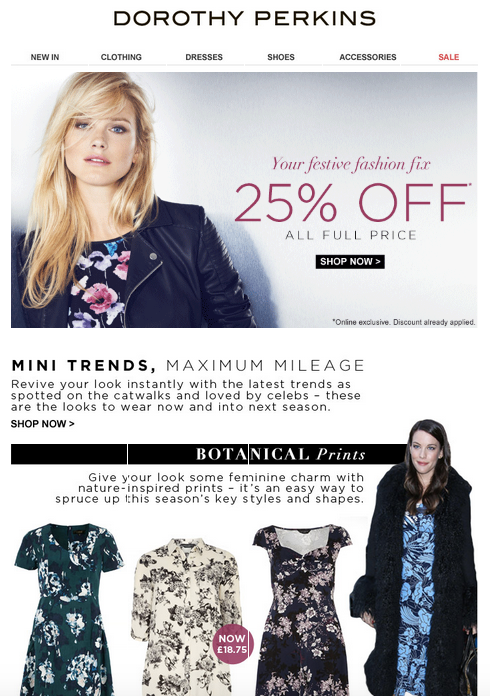 Why we love it: As with Dorothy Perkins above, H&M have gone with an editorial-style email promoting their ‘30% off dresses and jewellery’ promotion. We love how the items are carefully curated and are all directly shoppable from clicking them. Subject line: Have you got your Christmas jumper? Why we love it: Everyone loves a good Christmas jumper (especially with Christmas jumper day fast approaching), and Laura Ashley does a great job of showcasing its yuletide range with a cute animated reindeer jumper. Subject line: The biggest, best, most amazing, OMG, beyond anything, ever, sale event. Starts now. Why we love it: Puns and cute animals. ‘Nuff said. Subject line: Today only: 25% OFF the entire store! Why we love it: While a lot of online retailers are using GIFs to animate their Christmas emails, Anthropologie have set the bar incredibly high in their Christmas 25% off email. Why we love it: Boden is one of those brands that have established a really strong tone of voice throughout all of their marketing, and this email is no different. We love that the email is personalised, animated, and has a great live countdown timer that counts down the seconds until the offer ends.